When I was nearly forty, I was in a seminar team environment where each of us daily told others things we had going on about them in order to keep from building up issues. Things like, “It annoyed me when you…” or “I feel a little attracted to you.” It actually was fun and worked well. What happened for me in this process was that one person after another told me the things they thought about me with regard to my being handicapped. I was amazed at how much stuff people had going on about handicapped people, and I learned that it was a prejudice just like racism or ageism or any other ism. I know, you’d think by that age I’d have known this. I had seen it only in limited experiences, not as something that was apparently endemic in society. Several people told me that they anticipated that I would want them to feel sorry for me. After they got to know me, most could see this was very far from my nature, but, this was an assumption they had about all handicapped people. They had lots of ideas about how I must see the world, that I must be sad, that I must be angry, that I must be this or that. This was projection, I assumed, based on what they thought they would feel if they had a paralyzed leg (and also based upon my disappointment which they’d seen the first evening when I learned that the course was going to limit my physical activities). Though of course I had experienced these things over and over in my life, they were life assessments that came and went for me, like watching movies. I’ve never been one to hide my emotions well, and over time, I’ve learned that many people not only don’t express many emotions but are not even aware of what they feel. But here I learned that some or perhaps many people thought I must feel sad, depressed, sorry for myself, angry, needy, wanting more from people emotionally and physically than others wanted – most of the time! This was a fair cross section of people, no one really out of the ordinary, other than their interest in self-growth. I learned so much from these people who needed to unload their concepts about disability in a safe environment. Wow. What a life view. This was what people who were willing to trust me with these musings thought about me, about what they thought my mental and emotional makeup was. This was probably what many or most people thought but would never have the courage to tell me. In fact, the most emotionally upsetting aspects of my life had actually been that my dad had died when I was a small child, and that I had thus far not been able to get into and maintain a love relationship that nurtured me. 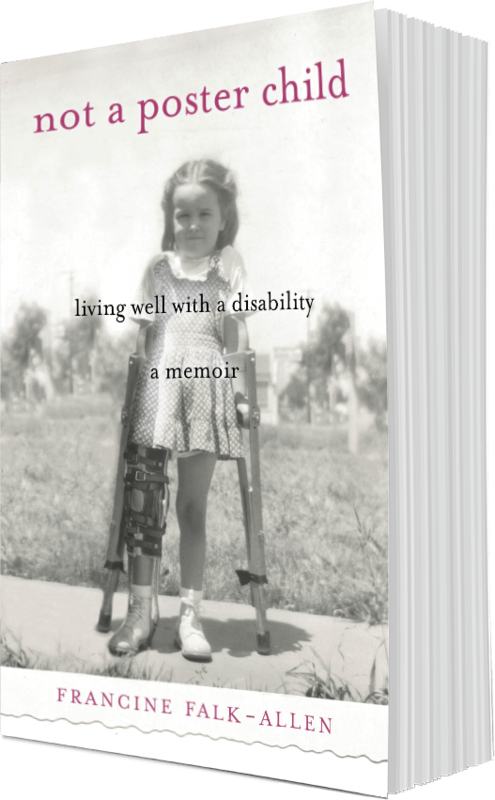 I had been far more depressed in my life about not having a husband or life partner than I had over having a paralyzed leg. My deepest hurt was not my paralysis, it was not sharing my love — the same problem any able-bodied person could have.